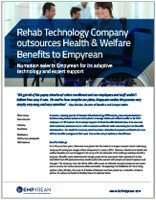 Calling on Empyrean Hi-Touch Benefits Administration as its outsourced provider, rehab technology company Numotion was able to transition from time-consuming manual processes to automated benefits administration for 2400 eligible employees in 130 locations around the country. “Empyrean has freed up my time, my staff’s time, and made our benefits administration much easier and more efficient. I can sleep better at night, knowing that we can rely on Empyrean,” according to Gary Gordon, Director of Benefits and Compensation.